SpaceX CRS-10 is launching to the ISS, let’s go make some photos. 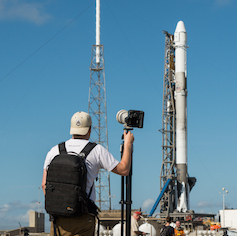 Today, I leave to photograph my 4th SpaceX Commercial Resupply launch to the International Space Station. SpaceX is set to launch their 10th CRS mission to the ISS for NASA this Saturday February 18th, 2017 at 10:01am ET (15:01 UTC). The Dragon (resupply capsule, the small bit at the top) carrying nearly 3 tons of expierments and supplies to the astronauts living aboard the orbital outpost. and I have the opportunity to photograph this historic launch. I will be representing Ars Technica as a photographer on-site in Cape Canaveral. A fun fact: Dragon will be carrying mice again, similar to the 40 “mousetronauts” that were taken up on CRS-4 to the ISS for research. “The mice are part of a series of experiments that NASA is conducting to understand the effect that microgravity has on the human body by extrapolating its effect on mice. This effort is to assist mission planners for NASA’s planned manned exploration of Mars and other parts of the solar system. While astronauts on the Space Station spend up to six months in microgravity, these other missions could last two years or more. This launch will be a mid-late morning launch, with similar lighting to CRS-7. I can’t wait. Here are 3 favorites I took at the CRS-7 launch. These cables keep Falcon topped off with fuel and Dragon powered until just before launch. I can’t wait to see and share what I’m able to capture on this trip. I saw this quote on Forbes today reading about the mice sent up on CRS-4, and thought you may enjoy hearing it.